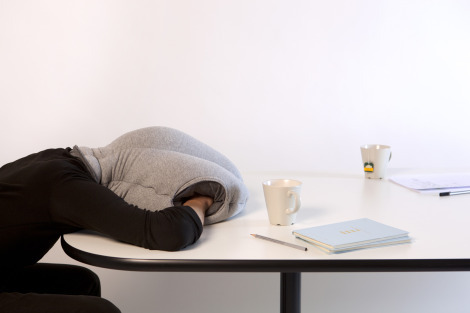 OSTRICH offers a micro environment in which to take a warm and comfortable power nap at ease. It is neither a pillow nor a cushion, nor a bed, nor a garment, but a bit of each at the same time. Its soothing cave-like interior shelters and isolates your head and hands (mind, senses and body) for a few minutes, without needing to leave your desk. Made me laugh and I think our Studiomate Paul could definitely use one. But how do you breath in this thing? It would give me claustrophobia! 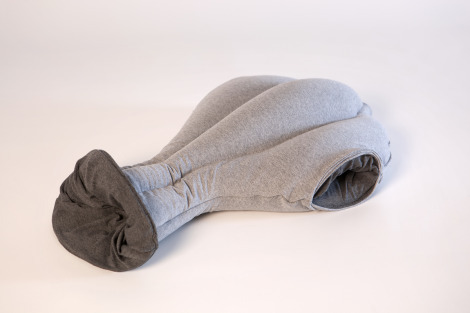 If I use that on my next flight, would anyone sleep also or just die laughing? Can you imagine wearing this on plane? I kinda want to. I would loooove to have one of these! It would make it so much more comfortable taking naps in the library cubicles! Does it come in dunce? But can you breath inside? I think an oxygen mask is a good improvement.. I could definitely use this in the library. Hey guys I finally found where you can buy it!